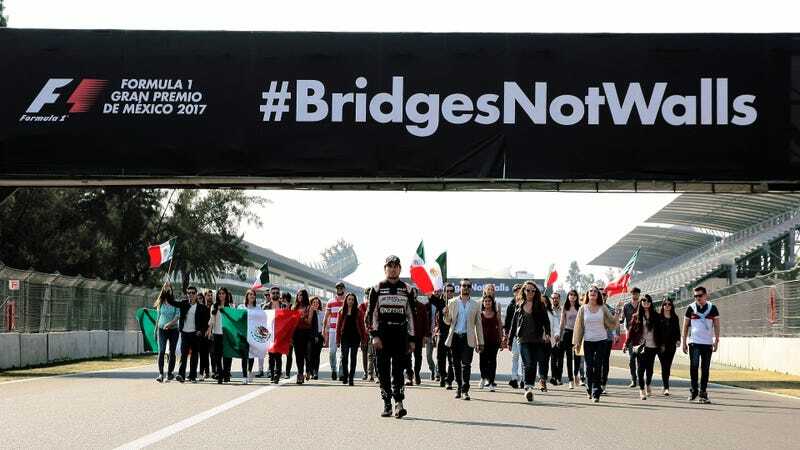 Officials behind the Mexican Grand Prix and driver Sergio Pérez have apparently had enough of U.S. President Donald Trump’s demonization of their country and his carping about an America-Mexico border wall, and they aren’t afraid to get vocal about it. Pérez and others recently voiced support the “Bridges Not Walls” campaign that stands in opposition to what they, and many Mexicans, deride as xenophobic foreign policy. Pérez already dumped a sponsor over an unfunny joke the company made about the wall on Twitter. Now he’s joined forces with the Mexican Grand Prix to say that none of this is okay. World class international events such as the Formula 1 Grand Prix of Mexico provide an excellent opportunity to showcase to the world what the Mexican people are capable of achieving when we work together. Through this unique global platform, Mexico has been shown as a warm and welcoming destination. While Formula One is far from perfect, it does stand as an example of a a truly international championship featuring the best and brightest drivers and automotive designs of the world. Most of all, it’s a place to gather peacefully with other gearheads who are there to enjoy the same fun thing you’re into. High-fives from Mexican fans over nerdy car jokes on t-shirts are practically part of the experience at Austin’s race. If you don’t leave an F1 race feeling some kind of peace, love and understanding for your fellow man, I don’t know what to tell you aside from maybe—just maybe—you did it wrong.